Nov 10 2015 Update #1 - Supermicro has already updated some of their product pages, with apparently no changes to SKUs or part #s or components, details below. Nov 10 2015 Update #2 - ServeTheHome has now published SR-IOV details at THE BROADWELL-DE INTEL XEON D-1500 SERIES AND SR-IOV. More thoughts below. Nov 11 2015 Update - ServeTheHome has now published Smore details on CPU variants that all fit in the same tiny Mini-ITX footprint New Supermicro Intel Xeon D Motherboards – Even with 12 and 16 core chips!. So today's announcement clearly indicates ongoing investment in rounding out the platform, with 8 more SKUs at a variety of 4 and 8 core sizes. Given the 8 core current Xeon D-1540 SoC is worth about $850 alone, one can expect next year's 16 core version will be quite pricey. All of these new 4Q15 SKUs are lesser models, with one exception. 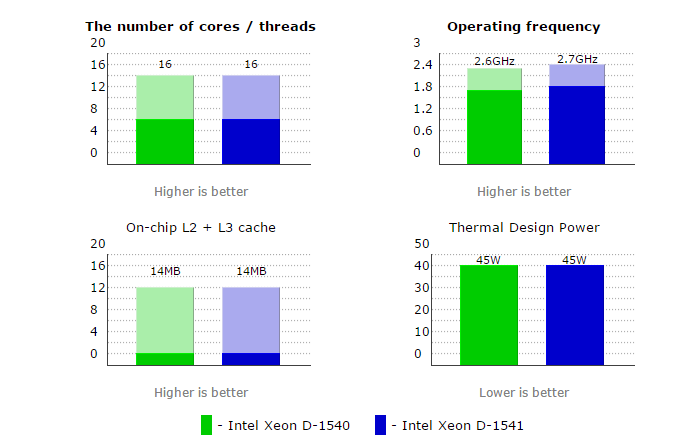 More to come but for general purpose servers, the Xeon D-1540 and D-1520 will still be highly relevant. For high-density and embedded applications, the new processors will likely be a game changer. We have reported previously that these SoCs were in extremely high demand. From "Intel Xeon D01540 s D-1541," click to visit the complete article. Missing from the Intel press release was any mention of what is happening with the ongoing SR-IOV saga that could affect a subset of enthusiasts, being actively discussed now at always-wonderful ServeTheHome. Interesting that AnandTech also mentions that same thread. See also comments here at TinkerTry. Keeping perspective here, I've never owned anything that didn't have some bugs to work out, this one just doesn't happen to sting me, as I don't currently have a compelling use case for that feature in my simple home lab. But I realize you might, and I'm continuing to track this, with requests for comment and/or documentation clarification already sent to Supermicro. One can rather safely assume the same components will likely be used for everything but the CPU, including the 10GbE that's now enjoying a shiny new VMware driver VIB. As for what Supermicro will do with the new CPU part, sure seems likely it'll just be a slight speed bump but sold as the existing SKU at resellers, the SYS-5028D-TN4T, and the X10SDV-TLN4F motherboard within. Supermicro will be letting me know. Intel's growing investment in the platform bodes well for a bright future in efficient computing, and a healthy ecosystem surrounding it. In other words, it's likely vast numbers of users and business will be using these very same I-350 1GbE and X552 10GbE chips. For the home lab enthusiast, this means a lot of folks will be joining you with PCIe 3.0 x 4 lanes goodness (PCIe slot and M.2 socket), empowering you to keep having more fun choices joining the world's fastest consumer SSD, which isn't even sold in legacy SATA3 2.5" form factor. The future is here now, and these new announcements help us clearly see into Intel's big future for these tiny and efficient 14nm CPUs. INTEL® XEON® PROCESSOR D-1500 PRODUCT FAMILY: PERFORMANCE FOR STORAGE AND NETWORKING USE CASES. Click the image to bring up the full PDF slideshow. 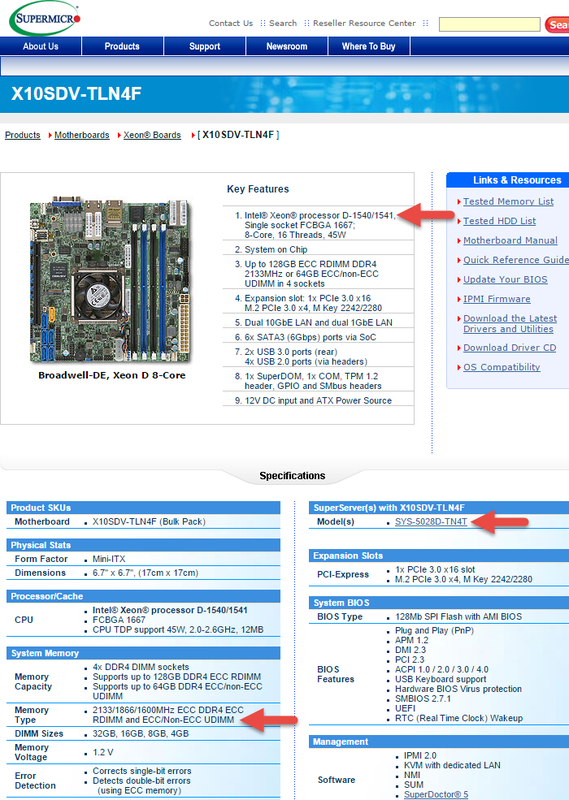 Well there it is, Supermicro has already updated the existing pages for the the X10SDV-TLN4F motherboard, the heart of the SYS-5028D-TN4T SuperServer. The CPU part is now listed simply as D-1540/1541, with the model numbers of the SuperServer and motherboard remaining unchanged, and the Supermicro list of tested 32GB RDIMMs also unchanged. Too early to say for be completely sure, but this sure looks promising, that they'll likely be no new qualification testing needed. This is good! 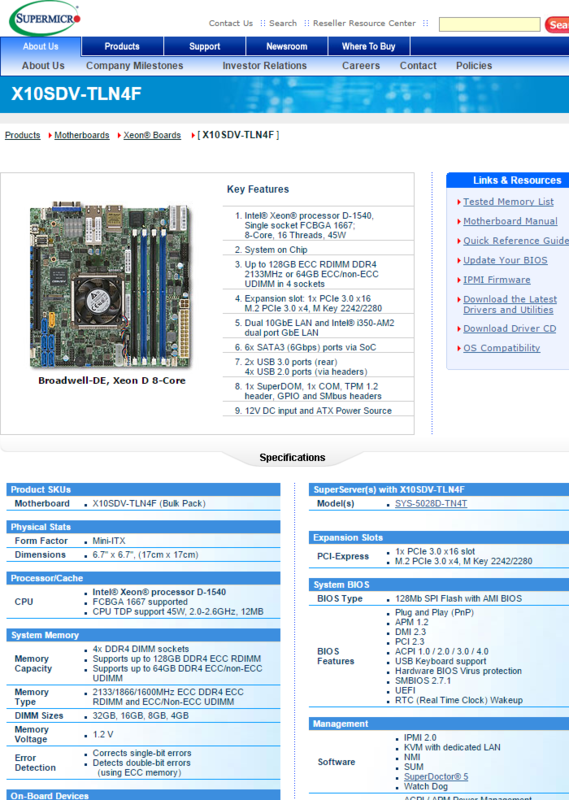 Supermicro X10SDV-TLN4F Product Page - as it appears on Nov 10 2015. Only change is the CPU, memory and model #s remain the same. Network is just better detailed, both use I-350. Click once to bring up picture viewer, then use right-arrow to compare with the next image. Supermicro X10SDV-TLN4F Product Page - as it appeared on Sep 14 2015 Click once to bring up picture viewer, then use left arrow to compare with the previous image, or go back and forth, to see that only the CPU changes. 2nd image credit is from the Internet Archive Wayback Machine Sep 14 2015 snapshot here. Re-thinking about this whole tiny speed bump thing, I'll admit, it's a little annoyance to me than anything useful. You can imagine Intel had some manufacturing process improvements these past 4 months of trying to ship these constrained CPUs in volume. So they decided to overclock the original, and sell is at new, giving them something slightly newer to sell. Unfortunately, when you combine that with no solid date in the press release, you only hurt sales a bit in the short term. As far as articles like my recent Samsung 950 EVO disk benchmark tests, it will likely stay valid exactly as-is, since I doubt the <5% CPU boost will have a noticeable effect on those results. But for things like Futuremark PCMark 8, those results would need to be re-run. Oh well, that's the way it goes with a new and growing platform, and we might want to just get used to it. It's up to you if you feel the slight speed boost, at likely the same price, is worth holding off for your next or first SuperServer order, for an undetermined amount of time. Now it seems like full SR-IOV support will only be in the Xeon D-1541 revision. This SR-IOV shortcomings of the Xeon D-1540 has already been notated in recent TinkerTry Xeon D-1540 articles. SR-IOV, the one feature missing among dozens of new features in this new platform. Still hands-down the best choice for me, personally, having saved up for 4.5 years and knowing full well I was an early adopter, getting mine the first days they were avaialble to the public, on June 25th. Intel's annoucements earlier this year included SR-IOV, according to this article. Intel's lack of direct public response to the longstanding questions about when SR-IOV support would arrive, with months conjecture left unanswered, until ServeTheHome's article today. Supermicro's lack of BIOS upgrade release notes or download page warnings to document that the SR_IOV menu option in 1.0a would go away once you flash it to 1.0b. Some companies, and individual people using their own hard-earned money, bought into the Xeon D-1540 product family based on seeing SR-IOV mentioned, and are now upset and disappointed to hear it likely won't ever work in their current motherboard. 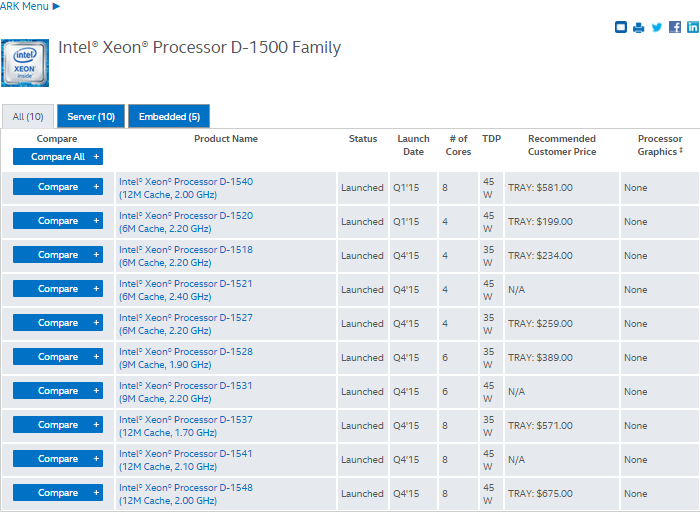 The Xeon D-1540 is a SoC design, system on a chip, which means that replacing the motherboard/cpu assembly with Xeon D-1541 would be costly (~$1000 USD). It would seem Intel simply encountered issues with getting SR-IOV working on the Xeon D-1540 chipset, which would not be the fault of the OEMs and resellers. I have no solid confirmation, this assessment is just from what I'm hearing and reading second-hand.